1. Combine the quinoa with 2 cups water in a medium saucepan. 2. Bring to a rapid simmer, then lower the heat, cover, and simmer gently for about 15 minutes until the stock is absorbed. 3. Allow the cooked quinoa to cool to room temperature. 4. 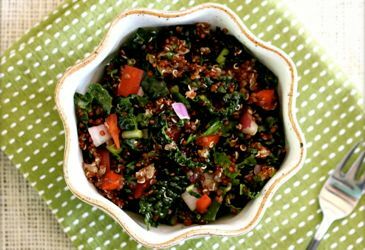 In a large serving bowl, massage kale by rubbing a small amount of olive oil onto your palms and massing the kale leaves for 30 to 60 seconds, until they turn bright green an soften. 5. Add cooked quinoa to the serving bowl along with the remaining ingredients. 6. Stir well, sprinkle with pumpkin seeds, and serve.